Sometimes it takes me a little while to come around to an album. When I first heard “Malibu Ken,” I knew I liked it and I knew I should like it more than I did. But I just didn’t understand it at the time. Although it’s only taken me a few months, I think I’ve managed to unpack my favorite parts of the collaborative album by Aesop Rock and TOBACCO. Aesop Rock is a rapper who released one of my favorite albums of 2016 with “The Impossible Kid. TOBACCO is a Pittsburgh, Pennsylvania-based multi-instrumentalist and leader of Black Moth Super Rainbow. He uses analog tape machines and pre-digital synths to create psychedelic warped sounds. Released Jan. 18, 2019, on Rhymesayers Entertainment, “Malibu Ken” is a follow up to the duo’s first collaboration “Dirt,” in 2008. At 10 Tracks and 34:34, its a relatively short album, but it is incredibly dense. Aesop Rock’s vast vocabulary and deep subject matter are so beautifully matched by the detached soundscapes by TOBACCO that doesn’t always hook, but sometimes turns, twist and fades. From the beginning, the name and the album cover of “Malibu Ken,” we’re brought into the deep, dark humorous world these artists have created. It’s like listening to a bit by the comedian Doug Stanhope; you have to take the ride for the payoff. 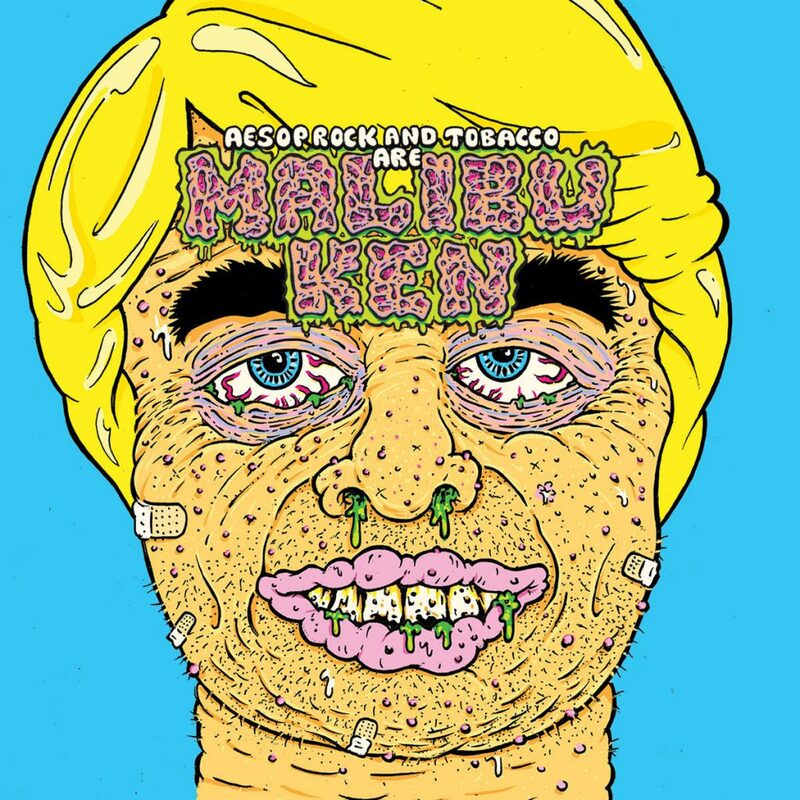 On “Corn Maze,” Aesop Rock tells us “I pull my hood down, I got some walls up” and we hear the first reference to the album title: “Every day I wake up in a gallon of sweat/Puke blood, hit the shower, turn to Malibu Ken.” Meanwhile, TOBACCO creates a distorted reality. One of my favorite tracks on the album, “Tuesday” really puts Aesop Rock’s humor in the spotlight while he muses about his neighbor finding a mushroom growing inside his car while he was on tour. There are so many great lines in the song, “I do not open mail, I do not answer phones/ The fridge is pretty much a home for mayonnaise alone,” is a good one. TOBACCO’s organ and synths on “Sword Box” create some of the atmospheric moments on the album. Aesop Rock uses the space to lament about feeling like a con artist as a musician. The first single from the album, “Acid King,” recounts, with pretty fantastical detail, the story of Richard Allan “Ricky” Kasso Jr. He’s a kid who killed his friend, 17-year-old Gary Lauwers, while they were high on LSD. Kasso Jr. went to the same high school as Aesop Rock. “Acid King” shows off Aesop Rock’s incredible songwriting and storytelling in addition to his affection for setting the scene in the 80s. There are 80s references throughout the album but the song is full of them. Aesop Rock and TOBACCO achieve the perfect combination of lyricism and production on “1+1=13.” The story explores superstitions and luck in an effort to change his seemingly unending misfortune. Once again, I can relate to Aesop Rock. Maybe I made the album to be more complicated than I first thought, but I am glad I re-listed to “Malibu Ken.” Now, I can’t get enough of the album. It’s a different and exciting direction for one of my favorite rappers and I’m ready to go along for the ride. Get “Malibu Ken” from Bandcamp, Rhymesayers, Amazon, Apple Music, Google Play, Spotify, Tidal and Deezer. Stream the entire album “Malibu Ken” on YouTube.